These Roasted Rosemary Potatoes are a family favorite that are SO easy, delicious and can be made ahead too. Perfect for a busy weeknight! Y’all! This is another one of those recipes that I’ve been making forever and I’ve wanted to share with you for so long but I can never seem to get a photo before they are all gobbled up by my family. 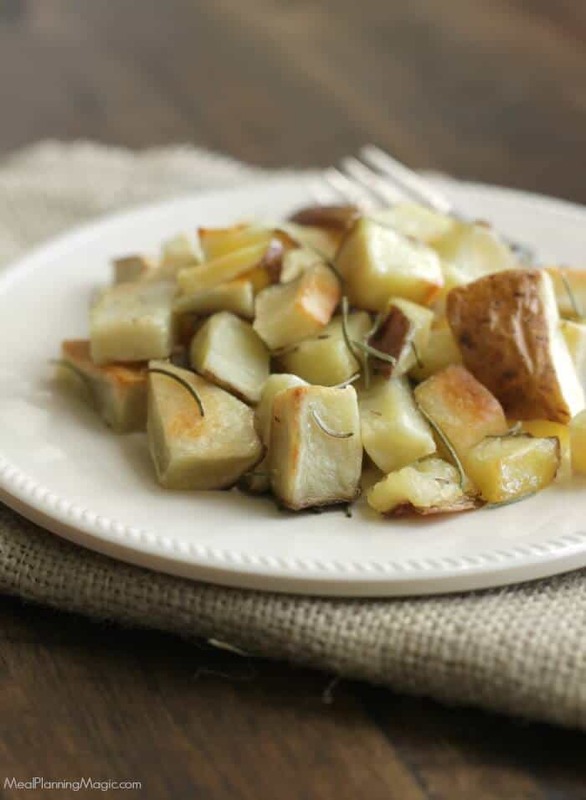 These Roasted Rosemary Potatoes are seriously one of their most favorite recipes. It is the perfect side dish for so many meals. My teenage daughter has even started making it now trying to get the crispiest but still soft inside potatoes. Now if you think you may not be a fan of rosemary, these potatoes may just change you’re mind. They are SO simple you will not believe they can taste so good. Have I gushed about them enough yet? Well, it gets better! I first tried Roasted Rosemary Potatoes when I was going to a freezer prep place similar to Dream Dinners and we were sold. But what was extra cool is that they were a FREEZER meal. Freezing potatoes? How does that work? A lot of people will tell you that you can’t freeze potatoes without them turning black or to mush. Well, if those frozen food companies can do it I figured I could too! The secret is parboiling the potatoes for a few minutes then freezing. I explain more of the technique in my recipe instructions. 3. Put strainer in ice water bath and cool for about 5 minutes. 4. Remove strainer and drain potatoes. Then spread on a baking sheet to freeze until firm (a few hours). Then store in labeled freezer bag to use as directed in recipe. Of course, you can make them from fresh anytime (that’s what I often do) but when I find a good deal on a bag of potatoes I can prepare a bunch of these to have on hand in the freezer to make on busier weeknights. Now on to the recipe! Spread potatoes on a large baking sheet. Roast potatoes for 20-30 minutes depending on how crispy you like them. Stir halfway in between. To make these ahead of time, bring a large pot of water to boil. Submerge diced potatoes in boiling water and boil for 3 minutes. DO NOT OVERCOOK! Immediately remove from heat and transfer with a slotted spoon to ice water bath. Drain cooled potatoes in a colander. In a large bowl, combine potatoes with olive oil, salt and rosemary. 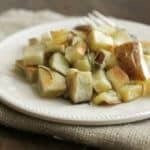 Transfer cooled potatoes to a baking sheet in a single layer. Place in freezer and freeze until firm. Transfer to large storage bag, seal and label. 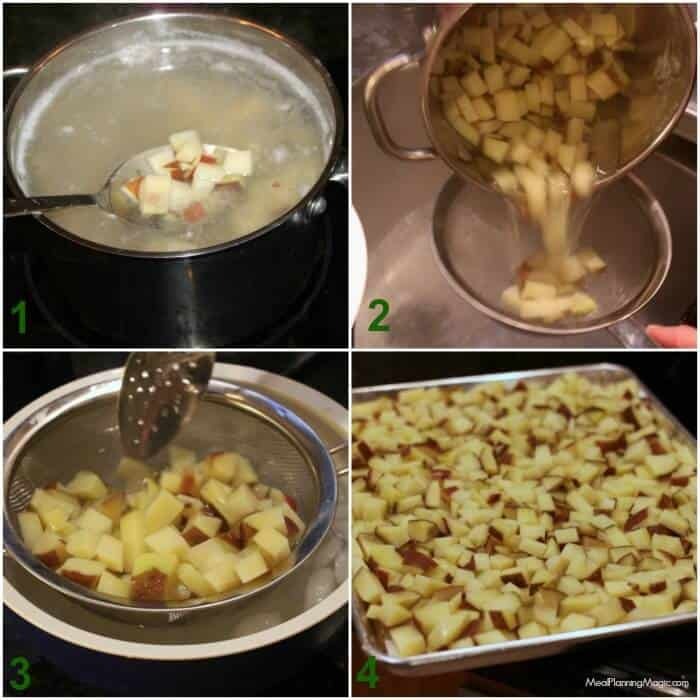 Take as many frozen potatoes as you want to prepare and spread on large baking sheet. DO NOT THAW POTATOES! Today I’m joining my Sunday Supper friends again as we celebrate all root vegetables! I’m personally so excited about this roundup because we like so many of these root vegetables on their own but the creative recipes shared here today will help me think outside the box and hopefully introduce my family to even more tasty recipes featuring wholesome good-for-you ingredients! I hope you’ll check out the recipes below from all the other bloggers! And don’t forget you can always follow me on Facebook, Twitter, Pinterest , or Instagram. And don’t forget to sign up for my email list here so you never miss a new post! 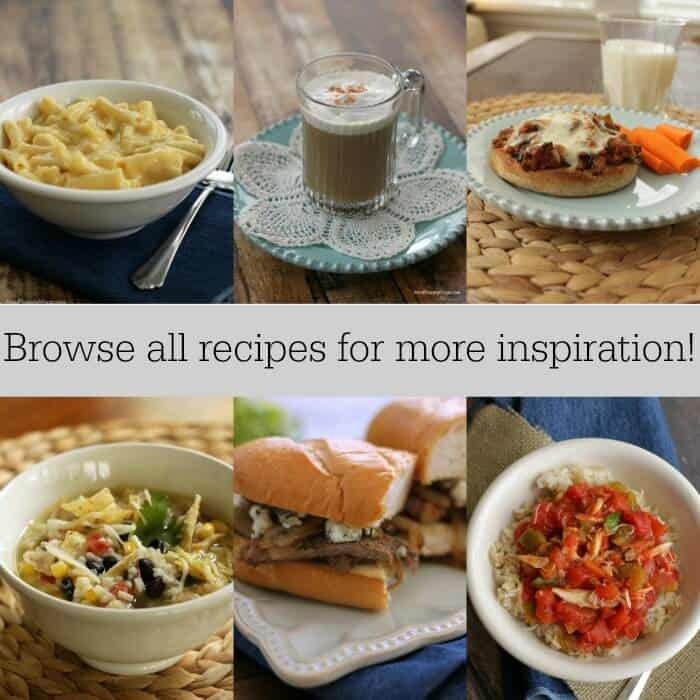 Each of these ways to connect all offer a little something different and are a great way to stay in the loop on new menu plans, recipe ideas, giveaways, organizing tips and more! Want to know what items I’m using in my own kitchen to help streamline my time there? Then check out my Amazon Shop too! It’s smart to make some ahead of time. I never think about that! We love them so much I needed to find a way to make them in bulk! 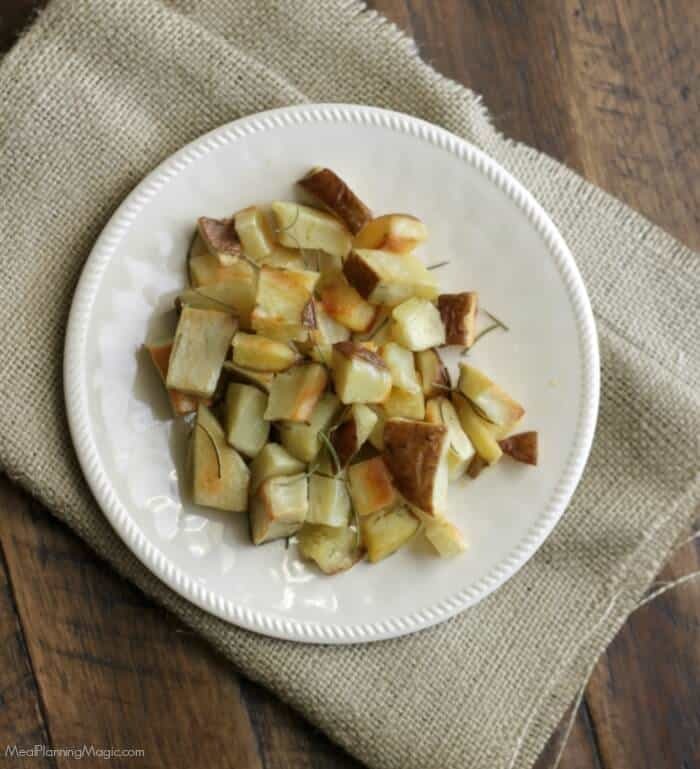 We love roasted potatoes around here—and so yummy with rosemary! Thanks for the freezing tip!!! Yes, the rosemary adds such a nice flavor! THANK YOU FOR THIS! I froze a pot pie that had potatoes in it and they did indeed turn black. Not pretty. So glad you found it helpful Lauren! It took some trial and error, but this method really does work! GORGEOUS roasted potatoes. They look super crispy and delicous with the rosemary. Thanks so much Christie! They really are a family favorite–we love them! Rosemary and potatoes go together so well, don’t they? I’m excited to try these in the make-ahead lunches I’m working on for next week! They look perfect!